The photovoltaic system has been in operation for a year as of 7/6/12, so here are a few relevant numbers. In case you want to skip the numbers and graphs, we're doing great! Summing up, the house used 7845 kWh in electrical energy and 1000 kWh in propane for a total of 8845 kWh. The solar array provided 45% of the electrical energy and 40% of the total energy. How does the house compare with other houses in the US? The average US house of similar size used 29,893 kWh annually. The corresponding numbers for the western US and for Washington state are 22,683 and 24,360 kWh. Not taking the PV array into account, the house used 29% of the energy of the average US house. If we include the electricity produced by the PV array as an "internal" source of energy, the house used 18% of the energy of the average US house. 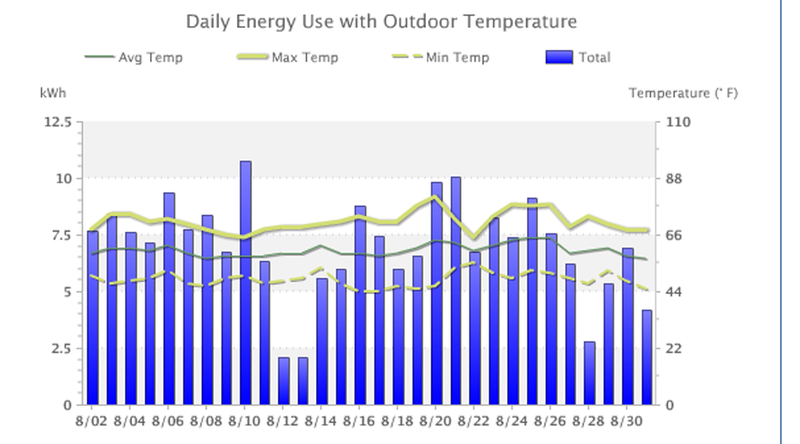 The graphs below, which are a great feature of the PSE website, show electricity usage on a daily basis for a summer month, August 2011, and for a winter month, January 2012. 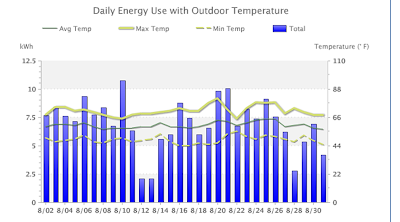 The summer data is representative of all usage except heating, and averages about 7 kWh per day. 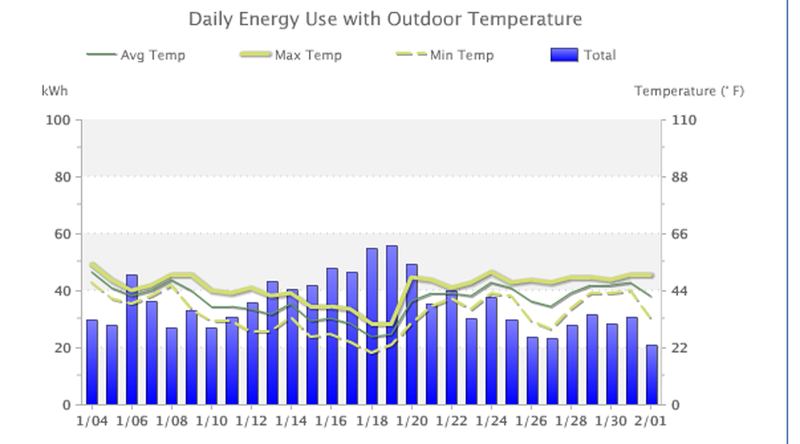 The winter usage is significantly higher because of the space heating load. Because the days are shorter, the lighting is in more use in the winter than in the summer. 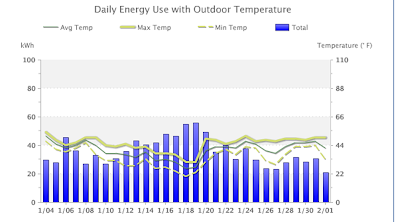 Note how the energy used peaks around January 18, when the low temperature was about 22 F. The third figure shows the total electricity usage for June 2012 relative to other users in the area. I'm a bit puzzled by the big difference and assume that most homeowners had to heat their house even in June. Initial indications are that the house is behaving as expected. It's useful to compare the usage with that calculated using the Passive House software for two people. The heating component could be measured using a Belkin Conserve power meter because the heating source is a plug load - a single 1500 W radiator on wheels. 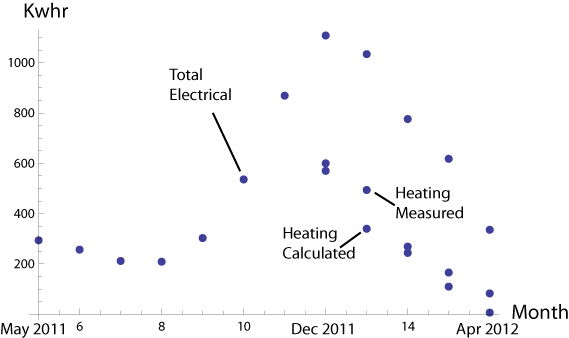 The figure below shows that the measured and calculated heating loads agree quite well for the months measured. 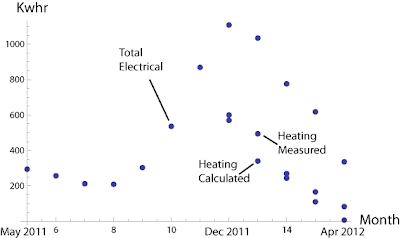 Assuming that the measured heating energy for December - April is half the annual value, the annual heating demand is 2700 kWh and that expected from the software calculation is 2009 kWh. The measured and extrapolated value is 34% higher than the calculated value. The calculated total energy is 6455 kWh whereas the measured value is 8845 kWh. This measured value is 37% higher than the calculated value.The higher values for heating and total energy could rise from structural issues such as thermal bridges that have not been modeled properly or from lifestyle issues - higher lighting and plug loads.